The most important part of putting is controlling the distance that you hit the ball. When the golf ball is close to the hole it is very easy to be accurate and hit the ball in the correct direction, however, the control of distance is much more difficult and often golfers have more putts than they should because they leave the ball short of the hole or roll it too far past. How many times have you played a hole nicely and hit the ball to 10 feet but then putted the ball six feet past or three feet short and put pressure on the next putt, often missing it? Here is a drill to control how far you hit the ball on the putting green. - Take six tee pegs and position them in a circle around a hole sticking them in the ground so that each one is approximately three feet away from the hole - this creates a target with the hole being the bulls-eye. - Get 10 golf balls and stand approximately 15 feet away from your bulls-eye. - The aim is always to try to hole every putt but if you miss the hole the ball must stay within the bulls-eye of tee pegs. - If you manage to get all 10, reduce the bulls-eye to two feet and then one foot. - Move to a different distance away from the hole. Controlling how far you hit the ball comes down to one simple element - the speed of the putter head. If the putter head is travelling at a high speed, the ball will roll a long distance and vice versa. Unfortunately, most amateur golfers find that controlling the speed of the putter head consistently is a big issue. It is not possible to measure how hard or soft the ball is hit, therefore, hitting harder or softer is not a consistent method of controlling putter head speed. 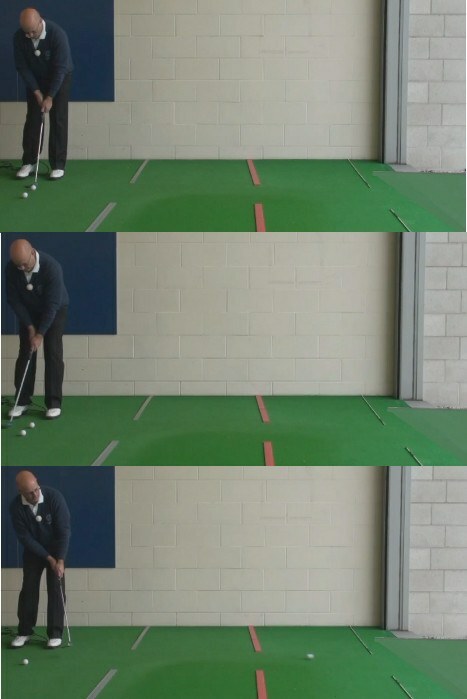 However, it is possible to measure how far the golf club head swings backwards and forwards. A short putt will need a short backwards and forwards motion while a longer putt will need a longer backwards and forwards motion. In these terms, a long swing will produce more putter head speed than a shorter swing. Imagine throwing a ball. If you were throwing a ball to a person standing two yards away, you would only move your arm a very short distance to throw the ball to them. If you were throwing a ball to a person standing 20 yards away, you would not necessarily throw the ball harder, you would lengthen the distance that your arm travels to produce more power, in effect, your throwing action would be longer. This is natural to throwing but unfortunately not to putting. When we putt, the swing needs to be balanced - the putter head needs to travel the same distance back as it does through. Use your feet to guide you. A short putt of three to four feet will only require you to swing the putter head as far back as the inside of your back foot to the inside of your front foot. A long putt of 15 to 20 feet will require a longer swing - perhaps swinging two to three inches outside your back foot to two to three inches outside your front foot. These distances are easily measurable with practice and will be slightly different for every golfer as everyone has their own rhythm. The key point is that the swing is balanced and that you lengthen or shorten your swing according to distance rather than hitting harder or softer. When putting at your bulls-eye, be sure to note your swing length and where the ball ends up. If the ball ends up long, shorten your swing length on the next ball and vice versa. Use this drill and control your putter head speed through swing length to putt the ball the correct distance every time.